Under the umbrella of HISD’s Equity and Outreach Division, the Ascending to Men Project is a mentorship initiative that seeks to provide positive role models and advocates for students who need guidance and opportunities for educational, social, and professional growth to underserved young men of color in the district. The program has been in place since the beginning of the 2018-2019 school year, piloting in 28 campuses. 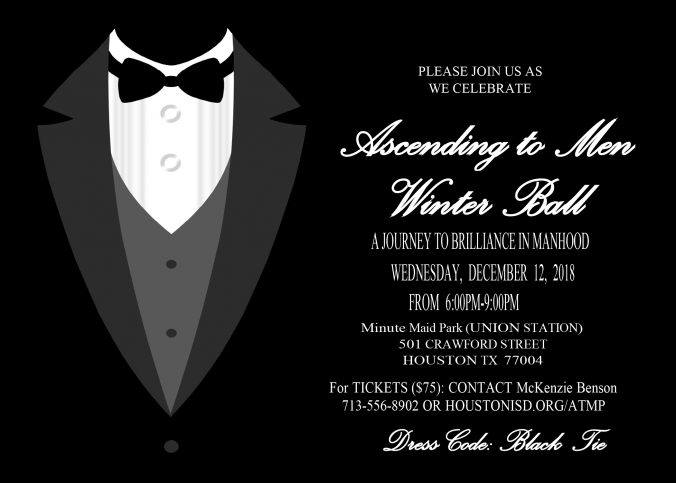 The public can support the ATMP project by clicking here to purchase tickets to the Winter Ball, by donating to the ATMP project, or by becoming a mentor for the program. “We know that many of our students don’t have access to these types of experiences, so we wanted to create a memorable night for these young men” Davis said.